das Blog: Is There a Football Match On? This morning we drove down to Luton airport to catch a mid-day Easyjet flight to Berlin, landing early evening. We stayed at the Art Hotel Charlottenburg; It was basic, quite a small room but ample enough. They seemed to have a Joan Miró / Piet Mondrian thing going on in the decor of our room, supplemented by strange light fittings from Ikea, and the hotel corridors and lounge had some interesting surrealist artwork. But the best part was, a computer in every room with free internet access! Maybe we'll get somewhere with the contract it is otherwise unlikely we will be signing tomorrow. The cafe downstairs also did a good range of breakfast options. On the train to the hotel we'd noticed lots of people going overboard with the black, red and gold, some people draping themselves in the German flag. And then in Charlottenburg a lot of Turkish-looking people were similarly going for a predominently red and white colour scheme. We asked the hotel receptionist if there was perhaps a football match on or something. 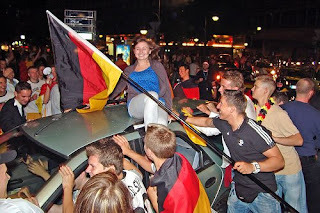 Of course, that evening was the Euro 2008 semi-final between Germany and Turkey! We went out for a pizza and had planned to spend the evening in some quiet Biergarten, but every bar, restaurant, cafe, Imbiss had a plasma screen showing the match and a crowd of football supporters spilling out onto the street. Public transport was getting to be a bit of an ordeal. I mean, I'm all for people letting their hair down and enjoying themselves, but when you are crammed into an S-Bahn carriage with noisy chanting football supporters drinking from bottles and blowing claxons, there are a few other places I'd rather be. So we took the tourist bus instead (100 and 200) and headed for the Zoologische Garten (the area around the Bahnhof of that name, not the zoo itself; Knut the polar bear was hopefully tucked up in bed by now, or he might have been spray-painted black, red and gold by ardent fans). We found a comparatively quiet place for a bier, and guessed what the score was from the cheers and firework bangers going off from time to time. Then came the final whistle and the place erupted! We couldn't believe how many people poured out of the 'quiet' bar we had been sitting outside. There were Germany supporters shouting their heads off and going mental (Germany won 3-2 by the way), irreconcilable Turkey supporters who looked as if their world had ended, and within minutes violent scuffles broke out right next to us. Quick as a flash the Polizei ploughed into the fray, pulling people out of the melee and slamming them against shop windows, all this right next to us where we were still calmly sitting and drinking our Weißbier. We thought a quick exit was in order, and pushed our way through the chanting skirmish of emotional red and white painted faces, and jubilant black-, red-, and gold-draped bodies, trying to avoid stepping onto the road where cars were speeding past blasting their horns and waving full-sized flags from the windows. After nearly getting flattened by a phalanx of heavily armoured riot-police in gas-masks speed marching in close formation, we made it to the S-Bahn. Here we were faced with a tsunami of supporters pouring off every train that came in, and flooding into the streets around the Zoo. Fortunately, our hotel was in the opposite direction to where everyone else was going, so we made it back our nerves intact. The hotel seems to be in a predominantly Turkish enclave, so luckily (for us; not if you were a Turkey supporter) there wasn't a wild celebration party lasting all night and the streets were quiet and subdued. Note to self: don't still be in Berlin on Sunday when the German team plays Spain or Russia in the Euro 2008 Final.